Adults looking to challenge themselves without stress on their joints or members who just enjoy the water can take advantage of our different water exercise classes. Instructors lead small groups through water aerobics, core strengthening and much more. 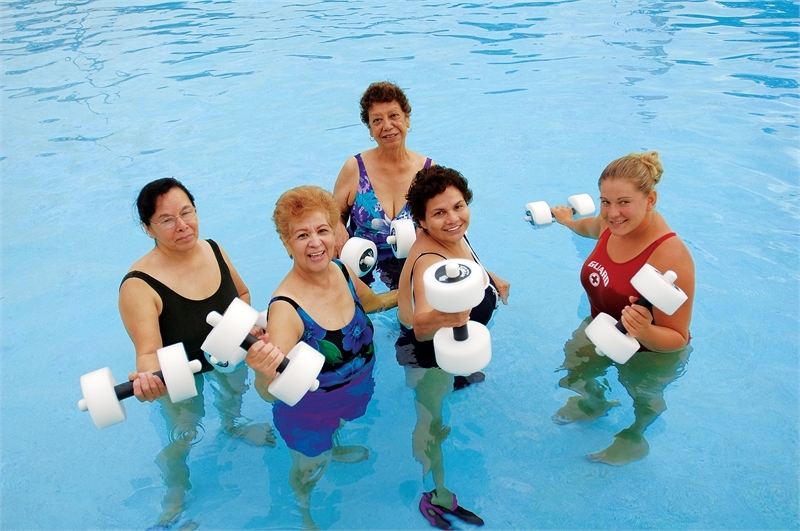 Gain muscle conditioning and cardiovascular endurance from the aerobic choreography and the resistance of the water. Ideal for all fitness levels, non-swimmers included. Programs are free to facility members, unless otherwise noted. Exercise in organized classes of low, medium or high intensity. Water adds resistance and cushions impact to knees, hips and backs. Participants may enter the water 5 minutes before the program is scheduled to start, please stay out of the way of any on-going classes. If lap swim is directly before the program, the lane lines will be moved 5 minutes before the class. Children 11 years and older may participate in classes with a parent. This program is for people with arthritis or limited mobility or range of motion. The class emphasizes good body mechanics.